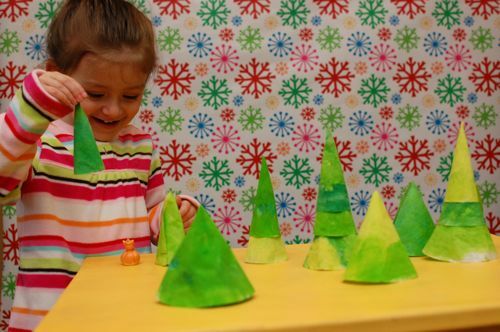 Clara and I made a fun pine forest playscape using coffee filters, and it’s been a big hit for imaginative play over here! 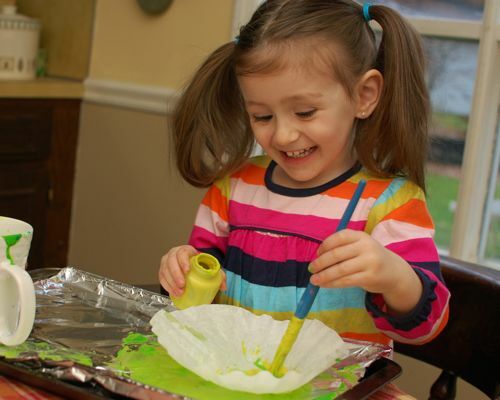 We painted a bunch of coffee filters in hues of yellow and green. 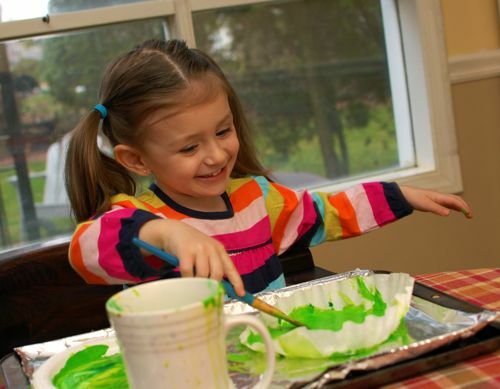 I love how happy Clara gets when she realizes that we will be painting — what fun!! She painted happily for quite some time! 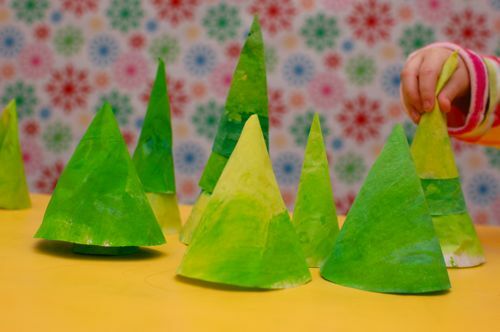 When they were completely dry, I cut them up into uneven thirds, rolled them into cones and used a little tape to turn them into pine trees. Clara has been stacking them up, and enjoying lots of imaginative play in her pine forest playscape! She quickly realized that the trees were the perfect place for a game of hide-and-seek with her figurines from Red Rose tea. Ta-da!! I think we will keep them on display as a festive (and playful) centerpiece for our kitchen table. Have fun!! My figurines! They are not toys. They are ACTION FIGURES. oo those turned out beautiful!! What a fun play set! Oh, I love this idea! We have got to make these! ROFL!! You can’t stop me now!!! Muhahahaha!!! I am looking for some paint to add to our craft stash. What type/where do you get good washable paint for a craft like this? TIA! We like Crayola’s washable paint, and you can find it at Target/WalMart. Hope this helps! What a cute idea. My daughter would probably love stacking them. My daughters face lights up when it’s time to paint things too. I love that! It’s like they just can’t wait to dip into all that paint! What a clever idea. I love crafting activities that can be played with afterwards. Very festive. Clara looks like a mini-Emily – more and more every day! This is a very cute idea! And my kids think painting is the best! Great idea! I love how they turned out and how much fun she is having with them. If it makes Mark feel any better, my oldest would probably find a way to turn them into a light saber…don’t ask me how, but everything can make that sound. LOL They would make fun light sabers too! How does she stay so clean??? My little artist is always covered in paint! She has her messy moments, believe me!! Have you seen this post? You must keep that straight. Action figures are very different. What a cute forest. Such a simple idea. Ha, ha, ha I saw Mark’s comment. ER likes to play with Brad’s old Star Wars figures and she always calls them “Daddy’s Dolls”. 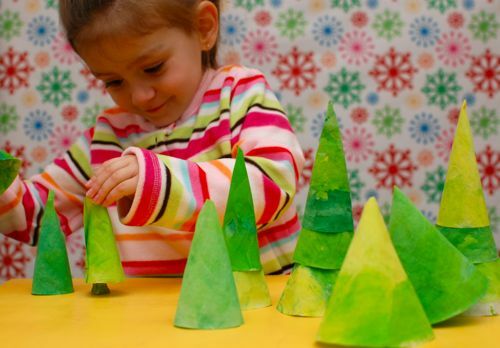 Cute way to use the many masterpieces our kiddos make. ER loves to paint and paint, this would be a fun thing to do with her. Awww… love how she calls them “Daddy’s Dolls”!!!!! I posted this on my facebook! I loved it. We didn’t have coffee filters, (well we do, but they are for camping and I know I will be sorry if I remove them from the camping box!) I just used butcher paper and cut circles. Of course they are lying on their side next to the “destruction town” train set. . . I have a boy. Oh Valerie, these are fabulous – your crafts never cease to amaze me – always so pretty! Hope to see you there! I know you are busy and have a blog network already… but would love your visits!